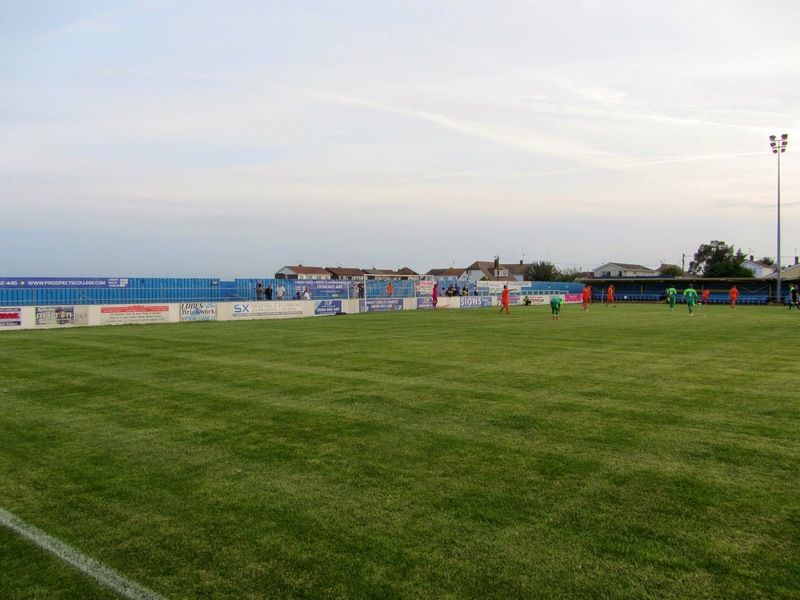 My fifteenth stadium of 2014 was on Tuesday 5th August at Park Lane on Canvey Island, Essex. 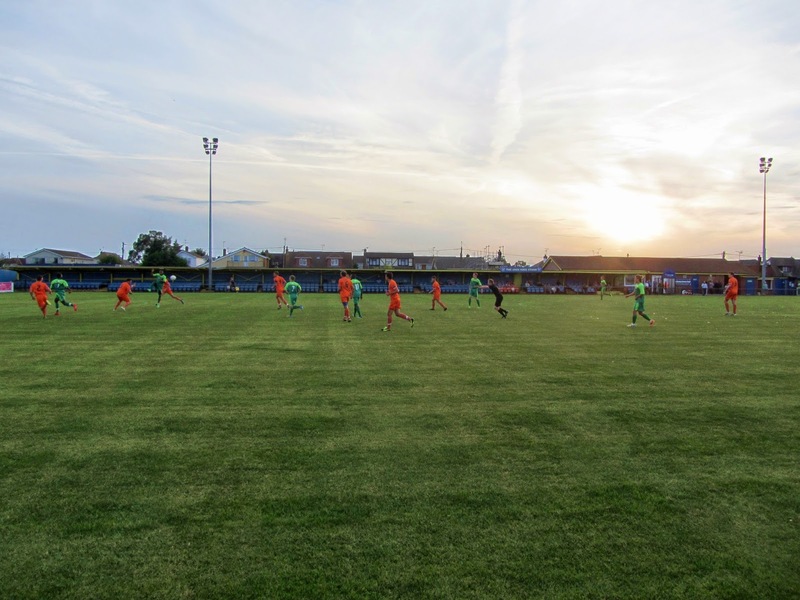 The match was Canvey Island vs. Maldon & Tiptree in a friendly. Park Lane is in the south of the island just a couple of hundred yards from the Thames Estuary. The venue sits a few feet below sea level with a marker on one of the stands to denote this. The stadium sits in a green space in the middle of a built-up area. The nearest railway station accessible by land is Benfleet, some 3.5 miles north-west of the ground. The west side of Park Lane features a thin all-seater stand which extends approximately 85 yards down to the southern end of the ground. This is fully covered and has just over 450 seats contained within it. Adjacent to this structure are the dressing rooms, food outlet and club bar. 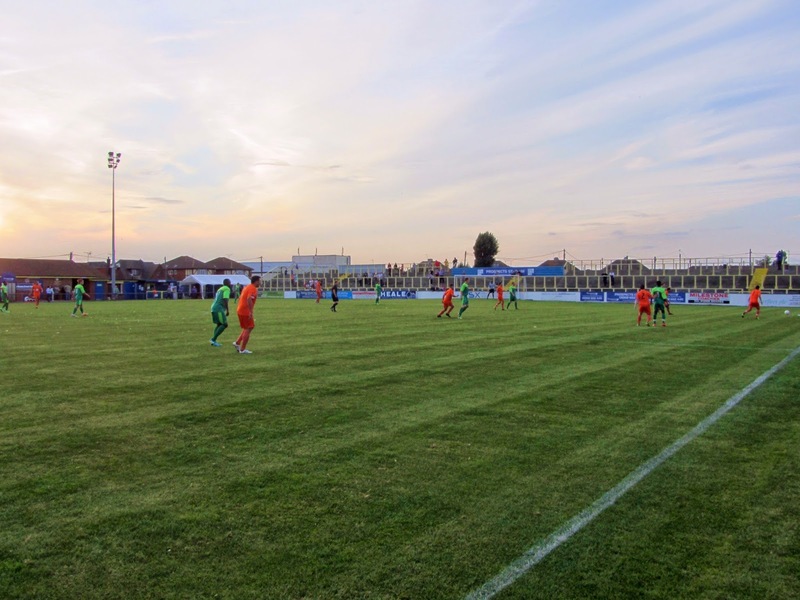 On the opposite side of the pitch there are two small covered stands either side of the half-way line with the two dugouts between them. These two stands have a few rows of shallow concrete and are the only covered sections on this side of the ground with the remainder of the east end given over to hard standing. There is fairly limited space behind the goal at the southern end of the ground with a small terrace section taking up the length of this part of Park Lane. At the opposite end of the pitch there is a more substantial terrace which, though also uncovered, provides better views of the action from a steeper vantage point. The north-western corner of the venue has the turnstile entrances as well as the access points to the club bar. The game was a friendly between Isthmian League Premier Division side Canvey Island and Isthmian League Division One side Maldon & Tiptree. The home side should have taken the lead early on when Victor Osobu crossed to the feet of Anthony Thomas who put the ball wide from a few yards out. However, Thomas made no mistake in the 33rd minute when he controlled a cross on his chest before wrong footing the goalkeeper and tapping into the empty net. Canvey's lead only lasted a couple of minutes - a Maldon long ball found Bradley Hunter on the edge of the box and he was able to out-muscle his marker before slamming the ball home. 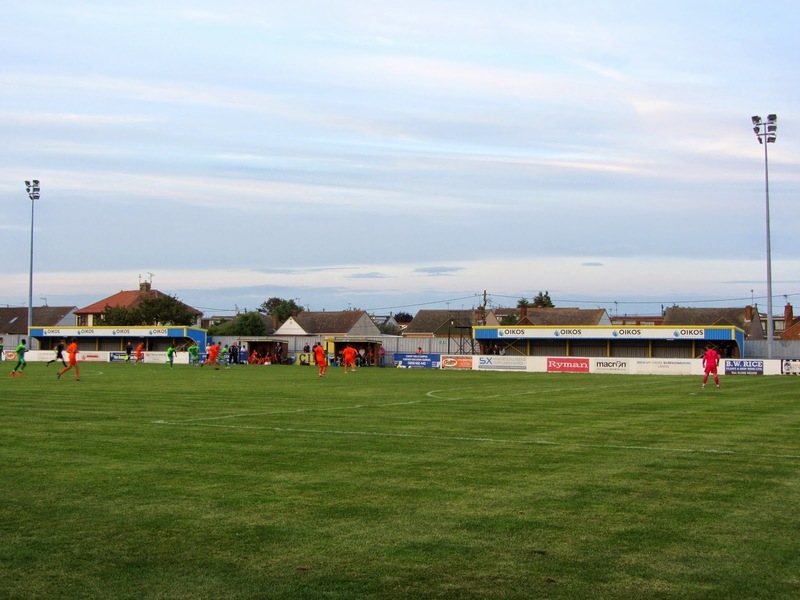 The Gulls came out on the attack at the start of the second half and in the 56th minute re-took the lead when Anthony Thomas' corner was curled into the back post and flew into the roof of the net via a deflection from Maldon defender Danny Smith. The visiting side then brought the game level again in the 71st minute when a blocked shot fell to Alberto Pinto who smartly controlled the ball before unleashing it into the bottom corner. If anyone was going to win it during the final minutes it was Maldon and in the 88th minute they came very close to snatching a winner. The ball was whipped into the box by a Maldon winger and when the Canvey goalkeeper collided with one of his defenders the ball was on its way into the net before a last ditch slide by Ashley Dumas just kept the ball from crossing the line.